Is Ignorance the Same as Nescience? Ignorance and nescience may be considered the same, but when looking at the core etymology of each word, we discover that they slightly differ in an important respect. Ignore: To refuse to pay attention to; disregard; take no notice of. Ignorant: Lacking education or knowledge. Nescience: 1. Absence of knowledge or awareness; ignorance. 2. Agnosticism. Despite nescient and ignorant being simplified to “not” + “to know”, there is an important distinction through the word ignore, which is the root of ignorant. Ignore is related to ignorant with respect to not paying attention to something that is there and can be known. You can be aware of a body of knowledge yet ignore it, while others don’t ignore it and learn to know it. Ignoring something is to deliberately pay no attention to it. Someone speaks to you and you ignore them. The reality is there, but you choose to willfully ignore it. The same applies to any body of knowledge that we can choose to ignore despite it existing for us to learn from.Willful ignorance is a refusal, denial, dismissal and disregard to consider looking at something and instead turn away from it. We can also absorb information, learn it, but then choose to willfully ignore that information. Essentially it’s sticking our head in the sand. Nescient is being unaware and unable to learn about a body of knowledge. This is either because it’s not pre-existing as a book or other media (undiscovered and unshared body of knowledge), or because we lack an ability to comprehend and become aware of that body of knowledge (infant). Ignorance differs in this respect. Ignorance is to choose to ignore it, even though you could learn about it. Nescience is a not knowing something that differs from ignorance because it is an absence of availability. A baby lacks awareness of reality and therefore knowledge, through the incapacity of being aware of it, learning it and knowing it. This is nescience, not ignorance. Babies are not ignoring knowledge, they simply can’t be aware of it. Knowledge of certain kinds is not available for them to know yet because of their lack of development in consciousness and cognitive processing capacities. Prior to X being researched, discovered and shared as knowledge, X couldn’t be known by simply going to learn it from some source of media. The knowledge has not yet been uncovered for it to be available for others to assimilate and propagate. Agnosticism is referenced to nescience as to mean to not being able to know, or not know something, because it’s not in our reach or availability to know it. Agnosticism is ‘not’ + ‘to be known’. No one truly knows about X because it can’t be demonstrated as knowledge. It’s not verifiable or demonstrable. We can talk about the idea of X as an unreality (i.e. a unicorn), but we can’t know anything about it in actual reality, because it’s not a verifiable demonstrable aspect of reality. Ignorance is based on a refusal to look at, a willful disregard, turning a blind eye, etc.. While nescience is an absence of accessibility to even be capable to see and integrate something as a known reality. The knowledge we currently have access to is available if we reach out and take it. 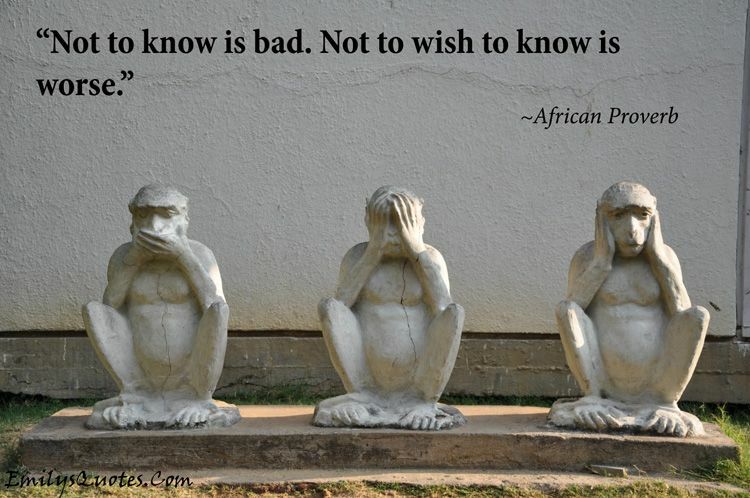 Yet, some choose not to know, don’t want to know, and don’t want to see. That is ignorance. Don’t see it, don’t hear it, and don’t talk about it. This especially applies to the ugliness of what the truth has come from a lower quality of consciousness. We have a choice in what we pay attention to, no matter how horrible, dark, negative, wrong, evil or immoral it is. Facing the mirror of ourselves, our lives and the world is a hard truth to swallow. The difference between nescience and ignorance can be demonstrated through the concept of evil existing or not. In a possible reality where there would be an innocence of no evil existing, it would be an experience of nescience of evil. There would be no evil action done by anyone. No evil would exist for anyone to know that evil could exist. Evil would indeed not exist because evil would not be manifested through actions and behaviors to recognize that evil exists. When something is not present in reality, it doesn’t exist, and is not verifiable or demonstrable, then this is nescience of that thing we can’t even know about. We could maybe imagine what this idea of evil is and know it in that way, but if it’s not even existing, then we can’t know it in reality. In this possible reality, this is to be nescient or agnostic of evil. In our reality, we are currently manifesting our consciousness as actions in forms of wrongdoings and evil that permeates all around us. Yet, people choose to be willfully ignorant of this evil. There is a difference between nescience of evil, and ignorance of evil to reject knowledge of evil that exists in our reality. Only a child can truly be nescient of evil in our reality. There is a responsibility associated with understanding principles of truth: courage and willingness to express the truth fearlessly to others by speaking it into existence for others to understand. Presenting information that a friend, family member or other person may not be willing to look at, because they are ignorant of it, can create oppositional relationships or circumstances of conflict, controversy and make things uncomfortable. This is what happens when the light of truth shines on the darkness: knowledge sheds light on those immersed in darkness of the unknown. Willfully rejecting knowledge keeps one trapped in the darkness of the unknown, in ignorance of that which can be known. Truth inherently divides from falsity. Ignoring truth, is ignoring reality, what ‘is’. Ignoring truth is also ignoring ourselves because what is happening in reality affects how we think, feel, behave and act in accordance to what is in reality. Reality reflects upon and influences us to form our worldview, self-view and self-knowledge. Those who don’t want to look at, acknowledge, or talk about truth, are ignoring themselves and their own experience that is affected by what ‘is’ in reality. They are lacking in self-knowledge and are therefore ignoring themselves. Care for, seek, accept, embrace, embody, live and speak the truth.